For much of its history, Kyoto ( 京都 ) was Japan. Even today, Kyoto is the place to go to see what Japan is all about. Here is where you’ll find all those things you associate with the Land of the Rising Sun: ancient temples, colourful shrines and sublime gardens. Indeed, Kyoto is the storehouse of Japan’s traditional culture, and it’s the place where even the Japanese go to learn about their own culture. 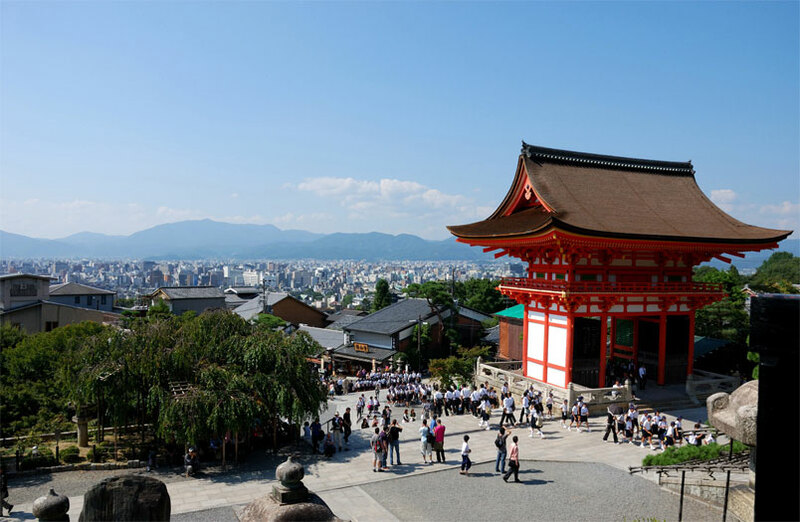 With 17 Unesco World Heritage Sites (see the box,Click here ), more than 1600 Buddhist temples and over 400 Shintō shrines, Kyoto is one of the world’s most culturally rich cities. It is fair to say that Kyoto ranks with Paris, London and Rome as one of those cities that everyone should see at least once in their lives. And, needless to say, it should rank at the top of any Japan itinerary. The Kyoto basin was first settled in the 7th century, and by 794 it had become Heian-kyō, the capital of Japan. Like Nara, a previous capital, the city was laid out in a grid pattern modelled on the Chinese Tang-dynasty capital, Chang’an (contemporary Xi’an). Although the city was to serve as capital of Japan and home to the Japanese imperial family from 794 to 1868 (when the Meiji Restoration took the imperial family to the new capital, Tokyo), the city was not always the focus of Japanese political power. During the Kamakura period (1185-1333), Kamakura served as the national capital, and during the Edo period (1600-1867), the Tokugawa shōgunate ruled Japan from Edo (now Tokyo). The best and most popular times to visit Kyoto are the climatically stable and temperate seasons of spring (March to May) and autumn (late September to November). Be warned that Kyoto receives close to 50 million domestic and international tourists a year. The popular sights are packed during the cherry-blossom and autumn-foliage seasons. Accommodation is hard to find during these times, so book well in advance. However, even during the busiest seasons in Kyoto, you can always find uncrowded spots if you know where to look (often just a few minutes’ walk from the popular places). Like Manhattan, Kyoto is laid out in a grid pattern and is extremely easy to navigate. Kyoto Station, the city’s main station, is located at the southern end of the city, and the JR and Kintetsu lines operate from here. The real centre of Kyoto is located around Shijō-dōri, about 2km north of Kyoto Station via Karasuma-dōri. The commercial and nightlife centres are between Shijō-dōri to the south and Sanjō-dōri to the north, and between Kawaramachi-dōri to the east and Karasuma-dōri to the west. Although some of Kyoto’s major sights are in the city centre, Kyoto’s best sightseeing is on the outskirts of the city, along the base of the eastern and western mountains (known as Higashiyama and Arashiyama, respectively). Sights on the east side are best reached by bus, bicycle or the Tōzai subway line. Sights on the west side (Arashiyama etc) are best reached by bus or train (or by bicycle if you’re very keen). Outside the city itself, the mountain villages of Ōhara, Kurama and Takao make wonderful day trips and are easily accessible by public transport. The Kyoto TIC (Tourist Information Centre) stocks the following maps: the Kyoto City Map, a useful map with decent insets of the main tourist districts; the oddly named Kyoto Map for Tourist, which is fairly detailed; the Bus Navi: Kyoto City Bus Travel map, the most useful guide to city buses; and the leaflet Kyoto Walks, which has detailed walking maps for major sightseeing areas in and around Kyoto (Higashiyama, Arashiyama, northwestern Kyoto and Ōhara). Although most of Kyoto’s attractions are further north, there are a few attractions within walking distance of the station. The most impressive sight in this area is the vast Higashi Hongan-ji, but don’t forget the station building itself – it’s an attraction in its own right.